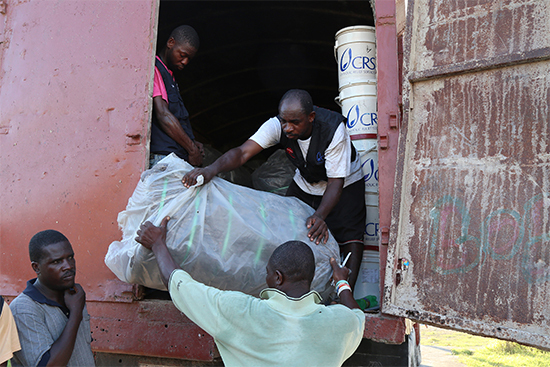 While the death toll in Haiti continues to rise as aid officials reach previously cut-off towns and villages, CRS is distributing blankets and hygiene kits to hundreds of people left homeless by Hurricane Matthew. So far, more than 900 deaths have been reported after the Category 4 storm bore down on Haiti on Oct. 4. Thousands have sought shelter in public school buildings, where CRS is now working to provide relief, including basic items like diapers, towels, toothpaste, toothbrushes. In the coming days, CRS will add critical shelter materials to its distributions, as many families are left in the open after their homes were completely destroyed by the storm. Many others were damaged. “What people really need is food and water. And they want to get home and start repairing what’s left of their homes. They need supplies,” Fieser reports. Before Hurricane Matthew hit, CRS engineers were dispatched to field offices in Les Cayes, Jeremie and Jacmel – cities in the southwest part of Haiti that were directly in its path – and are now assessing structural damage and beginning repairs. Water from Matthew’s heavy rainfall and wind-driven storm surge was over three feet deep in many parts of the town, flooding into homes. People are now beginning to return to markets in search of food and trying to dry clothing and other household items even as the rainfall continues, Fieser says. CRS is also ready with cash distributions to help people get through these next few days and weeks as the area markets come back to life. In Jeremie, a nearby town of 30,000 on the northern side of the peninsula that is southwest Haiti, almost everyone is said to be without water and also facing widespread destruction and no communications. There’s also a fear of widespread crop loss and food stocks, not just in Les Cayes – and important bread basket for Haiti - but also in the mountains around Port-au-Prince, where the storm caused heavy winds. entire country, for years to come. While dozens of CRS staff, already on the ground when the storm hit, have been working to address critical needs, additional teams have been sent to Haiti to support the response, which will include the distributions of temporary shelter materials, like tarps. 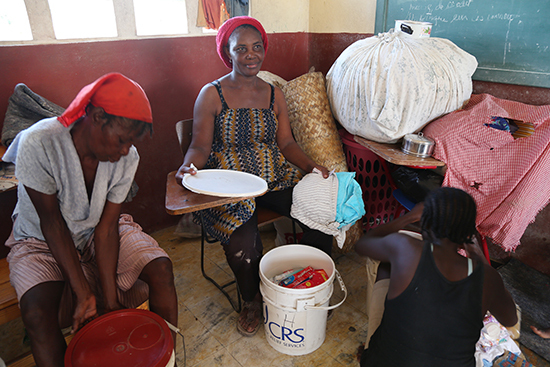 CRS has worked in Haiti since 1954, responding to Hurricane Hazel. In 2010, CRS responded to the massive 7.8 magnitude earthquake the struck in the country’s capital, Port-au-Prince, killing over 200,000.